One thing is for sure, we need to put skeletons in them before we can animate realistic movement. 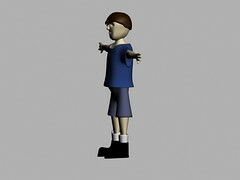 Also, adding a skeleton makes it much easier to animate than without one. I’m quite excited and hope we get started ASAP. I’d like to include it in my portfolio by the end of the month (at least the model…the animation probably isn’t realistic). I didn’t achieve it, mostly because of time, but I wanted his hair to look like the emo character that Chris blogged about long ago. I figure I would have needed at least an extra day to really get the hair even close. Did you know that in The Little Mermaid, Ariel’s hair was the hardest thing for them to animate? And in Ratatouille, the hair (on the rats) was probably the most impressive part. Let’s just say, there likely are people whose job it is to model the hair of a character and other people whose job it is to animate it. At least, I wouldn’t be surprised if it were that specific. 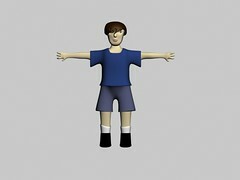 So we’ve started to dabble with character modeling in 3D class. Right now, we’re all following a tutorial so it isn’t too challenging (technically or creatively) and they’ll all end up nearly exactly alike. But it’s quite fun. I wish we would have been doing this a long time ago. The body is all one object, made of a few hundred polygons (probably around 300 before making it smooth, far more with the smooth modifier). Obviously, he is missing a head, but we haven’t gotten that far yet. And, I fear my head might ruin the body, so I better post about it now, my audience can focus on the good! The most difficult part was working on the hands. I had some vertexes crossed on the fingers and they looked weird and paper thin. I fixed them. (Yes, there were only supposed to be 3 fingers and a thumb.) So I’m a little proud of how they look at this point. 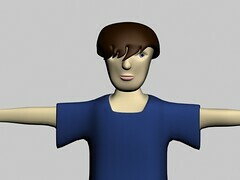 Soon, I’ll be adding the collar to the shirt, a head, and materials to the character. Anyway, I was thinking I should name him. Any ideas? UPDATE: I won 1st place in the 2D competition for my picture of Marissa…! Good thing I left that 2% chance! I again submitted two pieces into Beadlemania. It’s called Beadlemania because 1) Beatlemania is the term used to describe the era where The Beatles rocked (it still hasn’t ended!) and 2) the College of Arts and Sciences is in Beadle Hall. Beadlemania is to 1) showcase student work over the past year and 2) award those pieces that are most outstanding. Last year, one of my pieces won 1st place for the 2D category. I’m 98% positive I won’t be winning anything this year for my entries. (I left 2%; just in case it’s a Cinderella story). It’s not that the things I submitted weren’t good…I just know they aren’t as good as others’ work. They judge tonight or tomorrow, but I’m not hopeful. One award is good enough, right? I mean, it’d be selfish to win another. Anyway, I submitted that picture of Marissa and my Ping-Pong animation from last semester. The thing I do like about it, is that I animated the camera as if it didn’t know where the flower was going. Kind of like if a human saw it start floating away and wanted to film it…one just can’t anticipate where the wind will blow. So I am happy with that. Anyway, watch it. If you don’t have anything nice to say about it…that’s OK. Apparently, neither do I! Well, I went in to the 3D lab on Wednesday and basically spent about 4 hours making up 10 hours of work. But I did it. The reason why it went so much faster is because I’d been through it all and basically needed to be in a rhythm to finish, it was just going through the motions. It wasn’t so bad — it was more of the mind game of thinking “I already did this and could be getting AHEAD instead of playing catch-up”. But I’m now at the point I should have been on Monday, which isn’t so bad. The project is due a week from this Monday…which is unfortunate because there’s a lot I want to do. I really want to spend a lot of time on the animation part of the project. I’m on duty next weekend, so that’s to my advantage that I’m stuck on campus anyway, so I might as well go in to work on the project, rather than sit and watch TBS (which isn’t all bad!). The upcoming deadline is not advantageous, but it’s doable. More bad news, though…I’m in Big Stone this weekend. Just kidding! Well, I am in Big Stone. But that’s not bad news. Just thought I’d trick ya’ll! GOTCHYA! And it’s not even April Fools’ Day! GENIUS! I know it seems like I only post when I’m angry or frustrated. But those are the only times I have something “interesting” to say. My previous post showcased some of my 3D models for my exterior environment assignment. I have a sad announcement. Most of those files have been lost forever. It began on Friday. I was going to start merging my buildings (because I had finished them all) into my landmass, but needed to see what the sizes were for each one; so I started opening up each .max file. To my horror, the Post Office failed to open. Then, the church. Fortunately, I had saved sequentially (postoffice-01, postoffice-02, etc), so I was able to open up the second to last most recent file. Unfortunately, I didn’t save sequentially as often as I should have (I saved every hour, at best). On the Post Office, I lost about 45 minutes. On the church, about two to three hours (needless to say, I ended up remaking it). I tried to remap these objects, but the png files I had mapped on the object were not working. I went into Photoshop and tried to open the .psd file of the .png. It failed to open. So did the .png. So three related files failed to open. But these files should not affect each other. I mean, the .psd file isn’t linked in any way to the .max file. The .png is kind of linked, but still should not be affected. I know it isn’t coincidence that these particular files don’t work, but it just doesn’t make any sense because they’re not connected to each other. I remade the Photoshop file and the png and once the .max file was done, I remapped it to these files. Annoying. Today I worked on it a little during another class (with the same professor) because I was done with my project in that class. I tried to open the pharmacy, negative. I tried the Rausch TV Shop, rejected. The only common denominator for all of these .max files is that they have an “unwrap UVW” modifier on them. But that shouldn’t cause the problem. To remake the Pharmacy and TV Shop would take about 30 minutes because of their simplicity. Then, the unthinkable happened. My brown house (the one with curtains and lamp in the windows) failed to open. There isn’t even an “unwrap UVW” modifier on this file, so now there is no common denominator. I immediately went to Photoshop. Every single .psd and .png failed to open. I went back to Max and opened the second-most-recent file. It worked, but it’s far behind. You don’t want to know how many hours “catching up” on the house will set me back, so don’t read the next sentence. Six. I went to the green house. (Last Wednesday when Miles, David, and Dan went to 300, I worked on this house. I added curtains and a couch in the windows.) The file opens, and it looks the same as the picture I have of it in my previous post…no curtains and couches! I go to Photoshop, and those files don’t have curtains or couches in them! But they work, at least. Remaking them will set me back another three hours. So, I have at least nine hours of work ahead of me, just to get to the point I thought I was at last Friday. I know none of you know anything about 3Ds Max and can’t offer any help for recovering these files so that I don’t have to remake them. But I’m hoping on the very very very slim off-chance that someone runs across this blog by tomorrow morning and knows how to fix it.